Dutch white potato; good blight resistance (I'd estimate it as a bit more resistant than Golden Wonder, so about 7). Good flavour, flaky and floury texture. 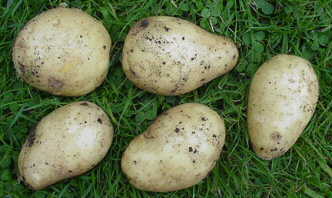 Tubers quite large in pots; some splitting during growth but the tubers heal up again. Haulms quite small.